The Miners Loop trail is located in the Klondike Bluffs Area north of Moab, Utah. The trail begins off of the EKG trail and makes a 2 mile loop around an old mine site. The Klondike Bluffs are riddled with abandoned mines which as near as we can tell were all engaged in the mining of copper. Many of the roads and jeep trails that were made during their endeavors have been closed to vehicle traffic and converted into some of the mountain bike trails that visitors to the area now get so much enjoyment from. To get to the start of the Miners Loop begin from the Klondike Bluffs trailhead and follow the Klondike Bluffs Road, or one of its adjacent trails, to the Dino-Flow trail. 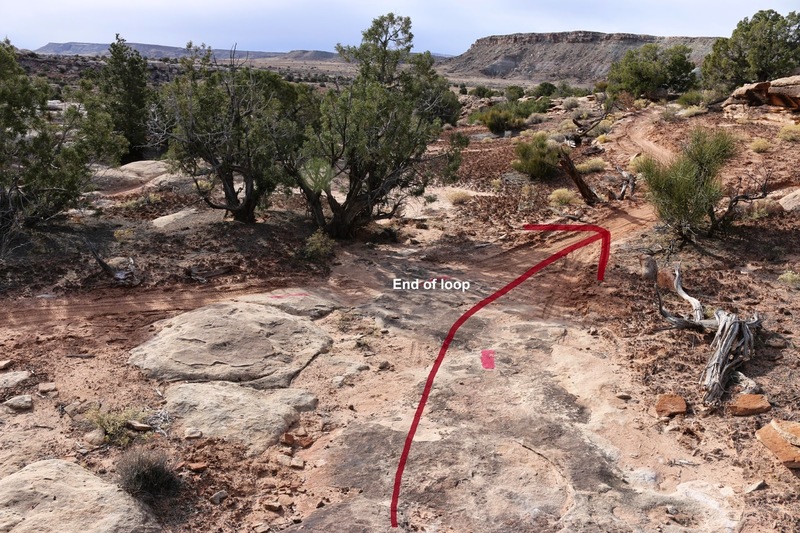 Follow the Dino-Flow trail to its intersection with the EKG trail and from there follow the EKG trail the short distance to the Miners Loop. The total distance from the Klondike Bluffs trailhead should come out to about 8 tenths of a mile. The loop begins within the first hundred yards of the trailhead. A trail marker at this point suggests taking the right fork as it reads: "This way best". After riding the trail we totally agree. From the fork the trail heads south and eventually drops down into the little valley that the trail loops around. At the 0.18 mile point from the start of the trail the route crosses the road that leads to the mine. From there the trail begins looping toward the east and climbs the ridge above the road. At the 0.57 mile point the trail crosses back over the road again as it begins looping toward the north. After crossing the road the trail works its way up the hillside snaking its way through boulders and following the natural contours of the land. On the day we were riding the Miners Loop for this post we saw a crew that was beginning the construction of the new Azurite trail. One of them mentioned that it should be finished in a couple of days and that it would be the last new trail for the area. And speaking of new trails, at the 1.17 mile point the Miners Loop comes to the junction of the newly built Malachite trail. The two minerals azurite and malachite are both copper carbonates. Specimens can be found along a couple of the trails in the Klondike Bluffs as well as around some tailing piles. The best specimens are at the rock shop on the north end of Moab. When the trail bends toward the west its level of difficulty increases a bit over what it has been up to that point. 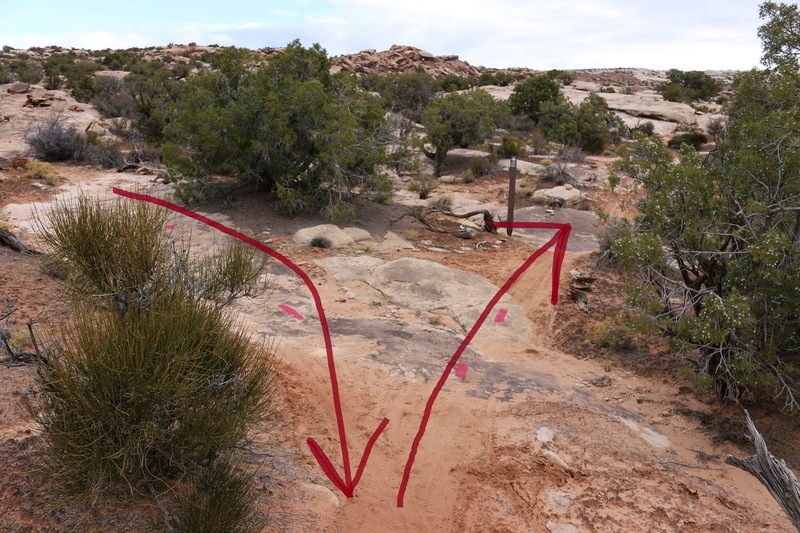 The trail tends to drop elevation between here and the trailhead making the broken and uneven slickrock easier to negotiate. At the 1.9 mile point the loop comes to an end and it is only a couple hundred feet back to where it began. The Miners Loop is short and sweet and worth checking out. 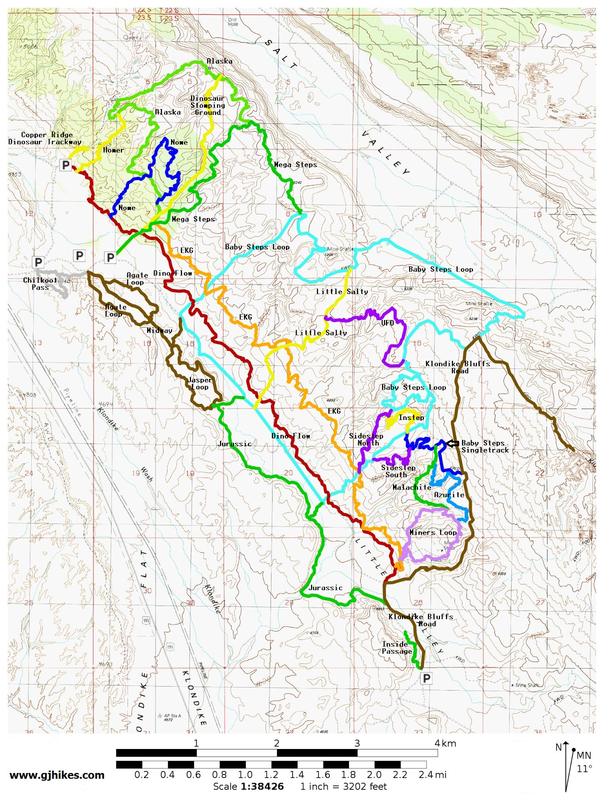 With the additions of the Malachite and Azurite trails there will be a lot more choices for trail combinations. It looks like those trails will provide good access points for the Klondike Bluffs Road and the Baby Steps Loop. If you would like to see it for yourself then all you have to do is grab your bike or 'Take a hike'.